Happy New Year! My first recipe post for the new year is Hearty Beef and Barley Soup. If you've followed along you have noticed that I've committed to Sugar-Free January - basically, avoiding refined sugar for the month of January. All this month I'll post recipes that are free of refined sugar. While you don't need to totally avoid sugar, this is just a way for me to come down off the holidays sugar high! What does this soup have to do with Sugar-Free January? I've found that if I have hearty and balanced meals I'm not as tempted to snack on sweets. This soup definitely fits the bill - loaded with vegetables, lean meat and whole grains, it is perfect for a cold winter's day, or night! Is it cold where you live? The temperature dropped to about 12 degrees here last night. For Alabama (and anywhere in my opinion) that is bitter cold! I can't imagine living up North where that may be the high temperature some days! Thankfully it is supposed to gradually warm up to around the 50's by next week - I can't wait! I crave soups on cold, winter days. Salad, a warm bowl of soup and crusty bread sounds like a perfect dinner to me in January! 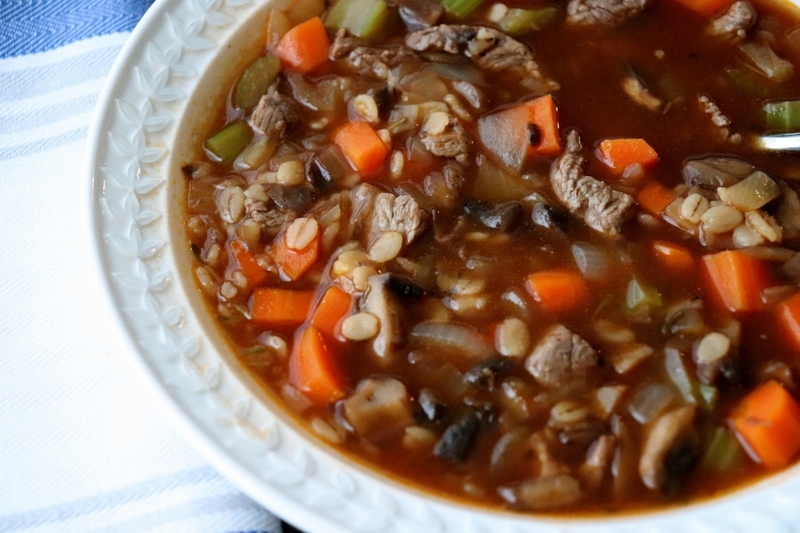 I added mushrooms to this beef and barley soup in order to decrease the meat slightly while still preserving the classic hearty flavor. Did you know? Some mushrooms are actually a good source of Vitamin D! Mushrooms have an earthy, "beefy" flavor. By adding mushrooms you can decrease the amount of red meat - budget friendly and cancer-protective! Vitamin D is known as the "sunshine" vitamin because our skin can synthesize it upon exposure to the sun. Vitamin D helps the body absorb calcium and maintain a strong immune system. Some studies have also suggested that Vitamin D may play a role in reducing the risk of certain cancers such as colon, breast and prostate cancer. Mushrooms contain ergosterol which is converted to Vitamin D when exposed to UV light (just like how our skin can synthesize Vitamin D). Most mushrooms available commercially are grown indoors and therefore contain very little Vitamin D. However, some commercial growers now expose the mushrooms to UV-B lamps for a brief period of time, allowing them to produce Vitamin D. A 3 ounce serving of these mushrooms provides 100% of the recommended daily value of Vitamin D. My Vitamin D level runs on the low side so I'm always trying to include foods with Vitamin D! 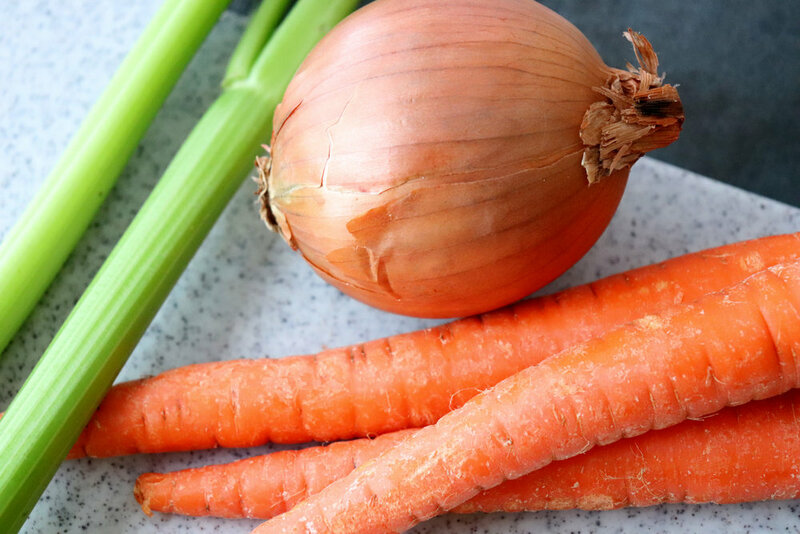 The base of this soup is the classic mirepoix - carrots, celery and onion. Sauteed in olive oil until slightly softened and then mushrooms are added along with whole-grain barley. Once all the ingredients are simmering away it takes only 15 minutes to produce this rich, hearty, stick-to-your-ribs soup! I like to serve some crusty bread alongside for dipping in the soup. Leftovers (if you have any!) will keep well in the refrigerator for several days. I had this for both lunch and dinner one day - so good! Heat 2 tsp olive oil in a large saucepan or Dutch Oven over medium heat. Add steak pieces and cook, stirring often until browned (about 2-3 minutes). Transfer the meat to a bowl and set aside. Add the remaining 2 tsp olive oil to the pan and heat. Add the onion, celery and carrots. Cook, stirring occasionally for 3-4 minutes or until slightly softened. Add the mushrooms, tomato paste and thyme and cook for 1-2 minutes. Add the remaining ingredients, bring to a simmer and cook for 15 minutes. Add the cooked sirloin steak and heat through for 1-2 minutes. Serve and enjoy!